Am Mòd Nàiseanta Rìoghail (The Royal National Mòd), Scotland’s biggest Gaelic Cultural Festival, will take place in Inverness this autumn for the first time since 1997. Now in its 122nd year, the event is the most important festival of the Gaelic language in Scotland. 18th October. It willfeature competitions in Highland Dancing, Gaelic Music and Song, Sport, Literature and Drama, offering Gaelic speakers of all levels to compete. It will bring thousands of competitors and spectators from throughout Scotland, the UK and from all corners of the globe including USA, Australia and Canada to Inverness. The Mòd is set to light up the city, kick starting with a vibrant Torchlight procession from Inverness Castle to Eden Court - the main venue for the event - where the opening concert will be staged. Acts confirmed for the opening concert include Skipinnish and the up-and-coming Scottish folk band, Gria. 2014 will also see the biggest Fringe event ever take place alongside the competitions. This will include concerts, book and CD launches, music sessions, poetry, dance and other art forms of every description. Around twelve pubs have signed up to providing traditional Celtic music in their venues, while street theatre will take place across the city. The fringe will encompass Urquhart Castle on the shores of Loch Ness to Fort George and the Culloden Visitor Centre and all areas in between. John Morrison, chief executive of An Comunn Gàidhealach, said: “We are delighted to be returning to Inverness for the first time in 17 years and to be bringing the biggest Fringe in the event’s history. “The competition is the heart of the Mod and we have had substantial entries this year. The Fringe also means we can bring Gaelic Culture to a new audience, Gaels and non-Gaels together and celebrate talented musicians from around the world with our exciting programme of events”. Fiddles, the concert will feature over one hundred fiddlers including world renowned artistes, plus local groups, it promises to be the most spectacular fiddle event in Scotland. A special concert to commemorate the 100th anniversary of World War I on Wednesday afternoon will be a showpiece event, with musician Erik Spence, creating a piece of music to go along with the poem Bantrach Cogaidh written by the late Rev John Macleod. Dingwall Gaelic Choir and Lochardil Primary School Choir will contribute. Other highlights include performances by Skerryvore, singing super group Cruinn and the talented Glenfinnan Ceilidh Band. 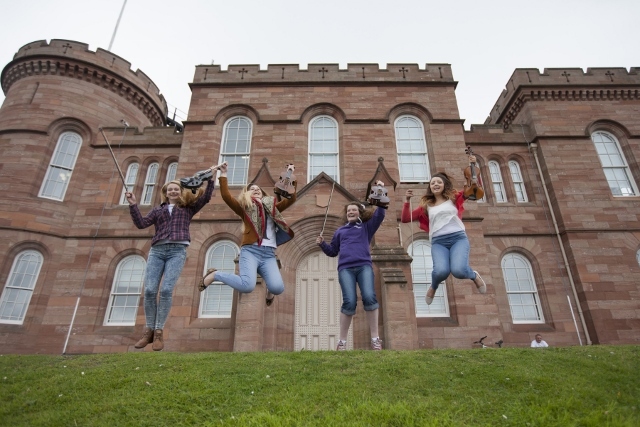 Lunchtime performances in the historic Inverness Town House by artists including Ewen Henderson, Barluath, and renowned clarsach player Catriona Mackay are not to be missed, while musical performances at the area’s stunning visitor attractions Urquhart Castle, Culloden Battlefield and Fort George will also take place. The Massed Choirs, with pipe bands, on the Saturday morning will bring the week’s musical festivities to a close with hundreds of choristers taking part. The Provost of Inverness, Councillor Alex Graham said: “The 2014 Inverness Mod is shaping up to be one of the best ever. The recent Inverness Local Mod was a huge success, and there is great awareness in the City that the National Mod is coming in October. The wide range of competitions and the large Mod Fringe will provide tremendous entertainment for locals and visitors alike”. work in communities across Scotland, alongside the annual staging of the Royal National Mòd. These events help to raise the profile of Gaelic amongst the wider public and are excellent focal points for Gaelic speakers, young and old, to gather and use their language”. The Royal National Mòd is supported by Highland Council, HIE, Creative Scotland, Caledonian MacBrayne, Bòrd na Gàidhlig, EventScotland, the Royal Bank of Scotland, SQA, BBC ALBA, the Scottish Government and Royal Mail.